On Sunday, the tour group departed Tiberias and headed south. We originally planned to stop in Cana where Jesus performed his first miracle of transforming water into wine at a wedding. However, the church’s Sunday morning worship services prevented us from stopping. So we continued south to Nazareth, the boyhood town of Jesus. We visited the Basilica of the Annunciation which is a magnificent building consecrated in 1969. Built atop first century ruins and a Crusader church, the traditional site commemorates the place where Gabriel spoke to a young peasant girl named Mary. 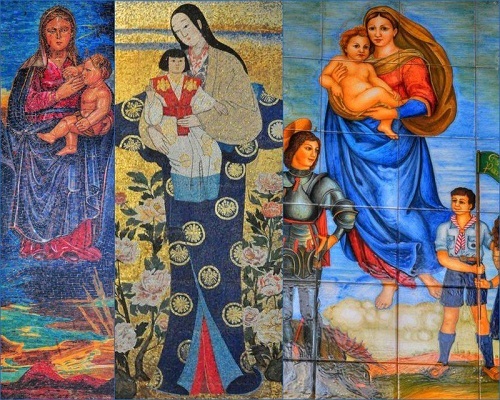 In the courtyard, artistic depictions of Mary from various countries are displayed. Her face and dress are shaped by each ethnic group. Depending upon the artist’s nationality, Mary appears to be Chinese, Japanese, Korean, European, South American, Australian, Russian, and more. Afterwards, we walked to the Synagogue Church. The Crusaders built the church in the 12th century on the traditional site of the 1st century synagogue. Bishop Watson led us in a simple service, and perhaps we worshipped where Jesus learned the Scriptures as a boy. After lunch, we rode through the region of Samaria to Nablus. Due to Palestinian unrest in the area, tour groups have only recently returned to the region. Everyone we encountered in the area treated us with hospitality. However, a few villagers pelted two of the three buses with rocks as we drove through the congested town. Jacob’s Well is located in downtown Nablus. A beautiful Eastern Orthodox church covers the site. Stairs lead to a grotto beneath the sanctuary. An ancient well over 100 feet deep still provides potable water. Some of the braver members of the group sipped the cool well water out of a common cup. According to John 4, Jesus encountered a Samaritan woman at this well. After requesting a drink of water, Jesus said: If you knew the gift of God and who it is that asks you for a drink, you would have asked him and he would have given you living water. We checked into the prestigious Olive Tree Hotel on Saint George Street in Jerusalem. A fellow minister familiar with the area gathered a small group of us as evening fell. We walked a few blocks to the Old City and entered through the Damascus Gate. We made our way through the ancient streets, passing vendors packing up their wares for the night. After passing through an Israeli security checkpoint, we entered a wide plaza in front of the Western Wall. The site is the only remaining wall of the Temple which the Romans destroyed in 70 AD. 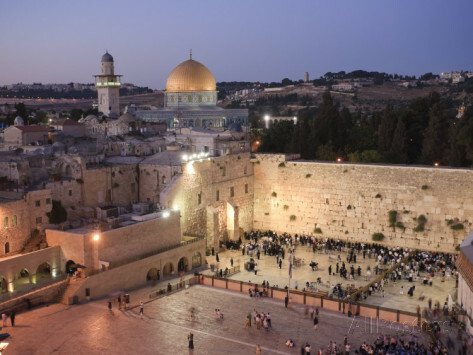 Sometimes known as the Wailing Wall, Jews stand in front of the wall day and night reciting their prayers to God. Facing the wall, women worship on the right and men on the left with a barrier in-between. After the men put yarmulkes on our heads, we approached the Western Wall. I placed my hands on the ancient stones, praying for my family and church. Traditionally, worshippers write their prayers on paper and stuff the slips into the cracks of the wall. I pushed a card into a deep recess where it joined the prayers of countless others before me. We returned to the hotel as a light mist began to fall in the night. After a sumptuous buffet, I collapsed into bed, anticipating our final day in the Holy Land as we toured Jerusalem. An ancient toast/prayer at the Jewish Passover meal declares: “Next year in Jerusalem!” This year God blessed me with the ability to fulfill this heartfelt hope. Thanks for your desire and ability to cause me to remember my journey there. Well written.